Did anyone watch Eurovision last night? I did, and honestly, I am not a huge fan of the winner, I loved Russian song, and of course, Serbian, what about you? Anyway, back to the topic, I am delivering you yet another weekly recap, so here we go. On Monday, we got new Yacht Club interior collection. The collection is, as usual, full of luxurious items. Pieces seem like 'high class' and I am loving it. Champagne glasses, luxury table and fantastic aquarium - add a little spark to your ordinary room. Fireworks look great too. On Wednesday, we got new Other World collection. This collection is fairytale themed, with long gowns, knight, fairies and dragons. The hairstyle is great too, and the crown for a real queen. The background is pretty amazing, too bad I have too many background and too little 'ordinary' rooms. 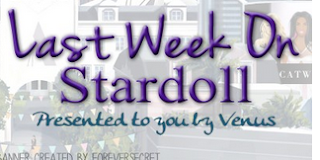 On Thursday, Stardoll introduced a fantastic new contest. You now have an option of creating your own jewelry and top 10 designs will be made into real life jewelry and sent to winners. I am loving this contest as it gives chance to talented designers get their work realized in real life, but also all of you can give it a try and design something, who knows, everyone's got a chance to win. I suggest reading guidelines before submitting your entry though. Good luck everyone! And on Friday, we got new PPQ collection. Another great collection inspired by PPQ real brand. There isn't much of a variety of colors - we only got blue, white and black. But pieces are really good, classy and trendy. It is though lacking of accessories, but with those colors, you could chose a variety of other accessories to combine. That is all for the week, looking forward to next one, especially as many of TV shows I follow are having season finales. Anyway, vote, comment, and see you next week.